The MaxKare 2.5 HP with 15 Pre-Set Programs Treadmill is currently popular due to the cost-effective design that makes it stand out among other treadmills in its category. Users have preferred it over others due to the fact that it has more features than those at the same price range. One of the interesting features on the treadmill is the 15 pre-set programs designed for achieving specific fitness goals such as fat burning, cardiovascular health, and endurance improvement and more. It is equipped with a powerful 2.5 HP motor that provides 0.5-8.5 mph speed range. It has a wide running surface size of 17 inches and a length size of 43 inches. There are 3 incline levels that could be manually adjusted and a blue backlit LCD monitor that keeps the user motivated and focused by tracking and displaying workout data such as time, distance, speed, calories burned, and heart rate. The frame is made of heavy-duty steel and it supports up to 220 pounds/99.7 kg maximum user weight capacity. It is foldable; therefore it won’t take up much storage space. That said, the treadmill is best used for walking, jogging, and light running workouts. It won’t be suitable for serious running or sprint because the motor horsepower is under capacity and the tread belt is not spacious enough for full stride extension for taller individuals. 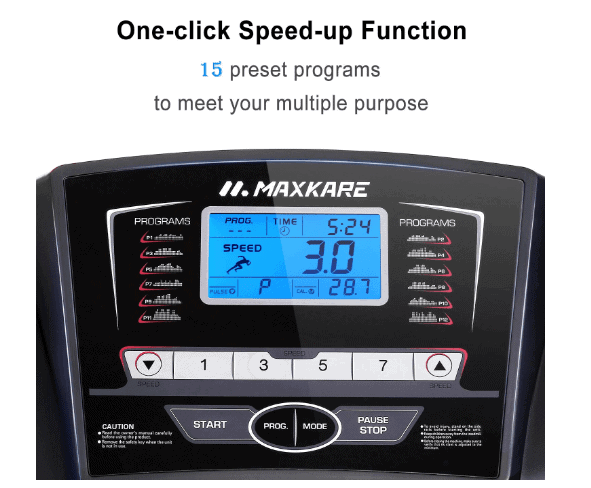 Click right here to have a peek at the discounted price of the MaxKare 2.5 HP with 15 Pre-Set Programs Treadmill on Amazon. The MaxKare 2.5 HP with 15 Pre-Set Programs Treadmill is designed for home use. It is furnished with more features than a treadmill of its category has ever had and that is the reason it’s so popular among its users. The frame is made of robust and solid steel that is coated with anti-corrosive paint. As aforementioned, it supports maximum user weight of 220 pounds/99.7 kg and it is stable during a workout due to the base framework that features a solid rear base and front stabilizer base that is equipped with transport wheels for portability. The MaxKare 2.5 HP Treadmill weighs about 91 pounds/41.2 kg which may not be too heavy but unarguably boosts its overall stability. Moreover, placing the treadmill on a protective rubber mat might be a good idea as it will further eliminate any sort of wobbling movement that might be during a workout. 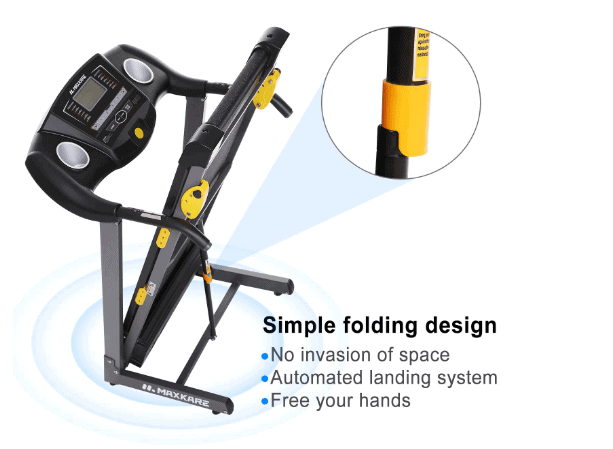 It is a not so large treadmill that also has a space saving design that enables the user to fold it up when not in use. The overall assembled dimensions are 53.3 inches long by 26.18 inches wide by 45.9 inches tall. In other words, the workout area appropriate for this treadmill would be 4’4’’ long by 2’2’’ wide area and a ceiling height of at least 7’. That said, the treadmill may require additional clearance of at least 1-2 feet on each side and at the rear for safety and convenience reasons especially if it is going to be used in a confined area. Users between the heights of 4’6’’-6’2’’ will be able to utilize the treadmill conveniently. The treadmill could easily be folded and unfolded by the folding mechanism and the soft drop system. The folded dimensions are 28.46 inches long by 26.18 inches wide by 46.4 inches tall. The full assembled length of the treadmill is reduced to almost half its size when folded to be stored away. The tread belt dimensions are 17 inches wide by 43 inches long. The running surface is equipped with cushioning pads that reduce knee and ankle stress and makes a workout more comfortable. 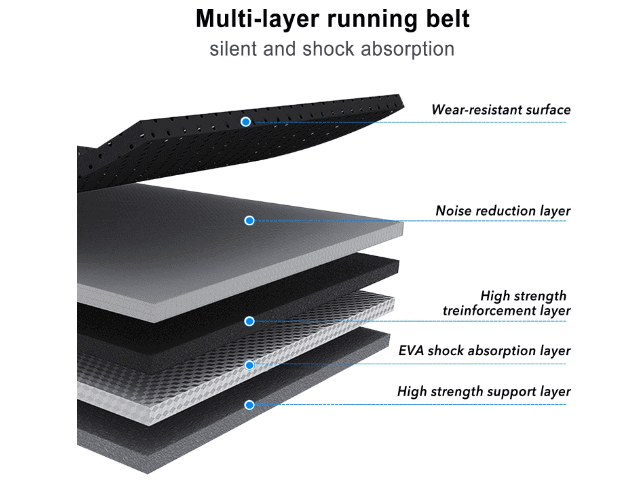 The running surface actually consists of several layers, namely, wear-resistance layer, noise reduction layer, high strength reinforcement layer, EVA shock absorption layer, and the high strength support layer. These ensure that the running surface does not wear out easily and it is able to absorb shock during workouts while it maintains silence. The MaxKare 2.5 HP with 15 Pre-Set Programs Treadmill has a powerful 2.5 HP motor that is capable of supporting walking, jogging, and light running exercises without overheating. Its operation is smooth and generates low noise that is hardly a problem or a distraction during workouts. This means that a user can workout without the apprehension that the family or the neighbor will be disturbed. The user can also watch a TV show, a movie or listen to good music while exercising on the treadmill without having to turn up the volume unusually high. The motor provides a speed range of 0.5-8.5 mph. The speed can be increased or decreased through the Quick speed buttons of 1 mph, 3 mph, 5 mph, and 7 mph. It could also be done by a gradual increment of 0.5 mph via the +/- speed buttons which are all located on the console. There are yet a set of speed buttons on the handrail that allows the user to adjust the speed on the go while still holding the heart rate sensors. The console on the MaxKare 2.5 HP with 15 Pre-Set Programs Treadmill is rather simple with fewer features. It actually consists of the +/- SPEED buttons, the QUICK SPEED buttons of 1 mph, 3 mph, 5 mph, and 7 mph, the START/STOP buttons, the PROGRAMS button, the MODE button, the SAFETY KEY and the blue backlit LCD monitor that displays real-time workout data such as time, speed, calories burned, distance, and heart rate. Remember, the EKG hand contact sensors which are on the extended handrails must be gripped during a workout in order to be able to view the heart rate data. The display has good readability that cannot be compromised even when viewed in a room that is not well lit, thanks to its backlit. As aforementioned, the speed can easily be controlled via the speed buttons on the console. The 15 pre-set programs can also be selected through the programs button. When a pre-set program is selected a certain speed level is assigned to it automatically and these programs are designed to help the user burn more calories, improve cardiovascular health, endurance and more. Basically, the features on the console are easy to manipulate. The console/motor requires a power source in order to be functional. In other words, the treadmill must be plugged into a power outlet for it to function. The MaxKare 2.5 HP with 15 Pre-Set Programs Treadmill is equipped with a manual incline system that could to three-stop slope levels. The incline system is at the right side of the deck and can easily be adjusted to change the intensity of the workout so that more calories could be burned and more muscles toned. 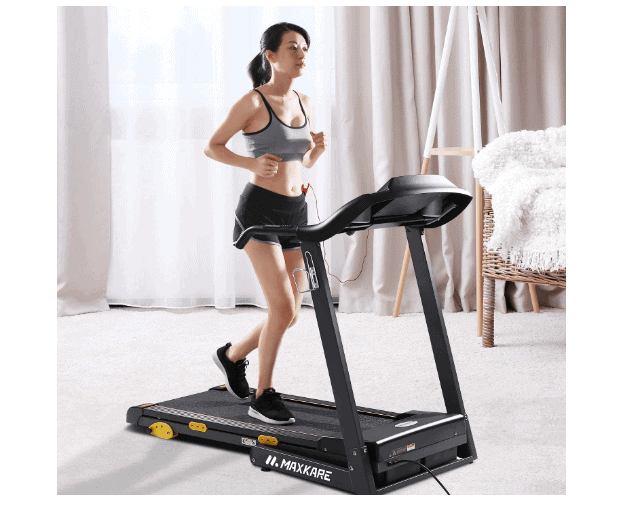 The MaxKare 2.5 HP with 15 Pre-Set Programs Treadmill has folding and unfolding mechanisms that make it a treadmill with a space-saving design that saves up space during storage. The assembled length size of the treadmill is reduced to almost half its size when folded. A space area of 2’4’’ long by 2’2’’ wide and a roof height of 4’ will suffice for the storage of the treadmill. Transport wheels are also integrated into it for easy relocation process. Storage next to a wall will be a great idea. The treadmill comes with two cup holders that could be used for keeping water handy for hydration and for keeping other items such as keys, remote control and more. There is an additional holder by the side of the treadmill which could accommodate a water bottle. This is very important because staying hydrated throughout the entire workout session is essential. The MaxKare 2.5 HP with 15 Pre-Set Programs Treadmill has a good approval rating on Amazon at the time of this review. Users have shown satisfaction with the performance and quality of the treadmill and have also indicated they would recommend. Different retailers ship the MaxKare 2.5 HP with 15 Pre-Set Programs Treadmill at a cost outlined by their shipping policy. The assembly of the treadmill is pretty easy because the major components are already assembled. You only need to attach the console mast and the console to the main core unit and this won’t take more than 30 minutes. The tools needed for the assembly and an instruction manual that guides you through the process are included in the package. The unit doesn’t require any major maintenance. Basically, the tread belt needs to be lubricated periodically. Keep the treadmill clean from dirt and sweat at all times. 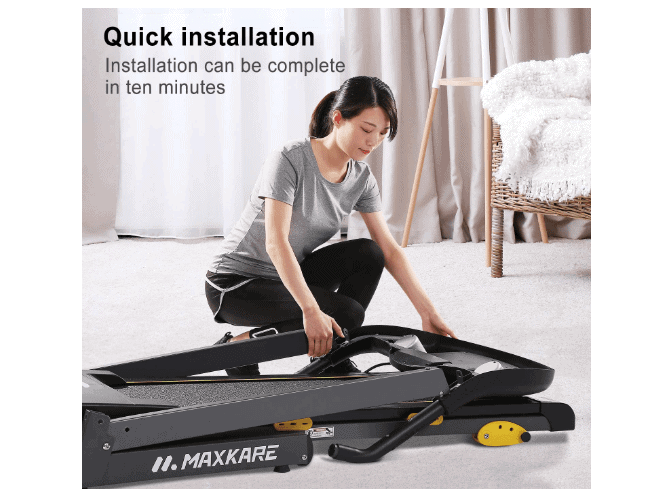 Further instructions on how to maintain the MaxKare 2.5 HP with 15 Pre-Set Programs Treadmill is included in the owner’s manual. The MaxKare 2.5 HP with 15 Pre-Set Programs Treadmill is suitable and ideal for anyone that wishes to lose weight, improve cardiovascular health and endurance. It is a cost-effective treadmill that has been proven worth having for home use.